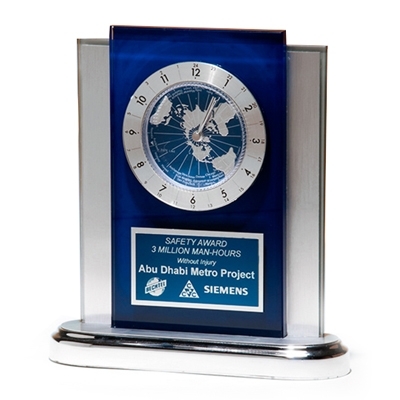 This stylish, blue and silver executive clock features a world time clock movement. A blue and silver plate is laser engraved with your text and/or logo. An excellent choice for today's global executive! *This award allows for a maximum of 10 lines of text. Text will be centered on award unless otherwise stated below in the Personalization Notes. All orders include a proof with one free revision prior to production. If you want to use your logo from a previous order you placed with Personalized Awards please select "Logo on File" below. If you would like to use a new logo select "New Logo" below. If multiple different products use the same logo, only select "New Logo" for one of the products. © 2019 Personalized Awards, Inc.